Hey all I know it so I missed posting last week, but I wanted to get a post in this week for sure. 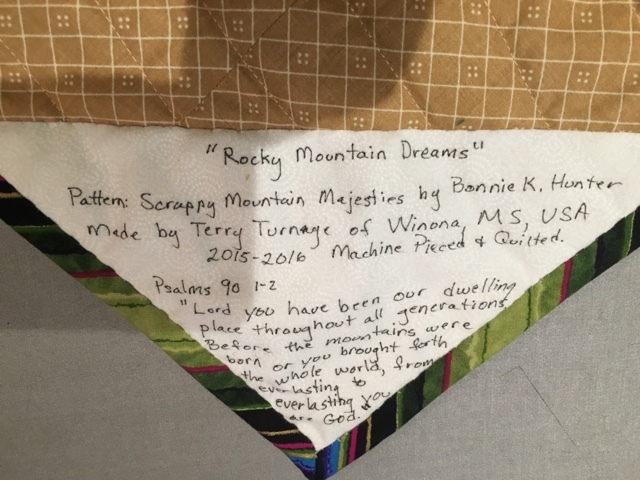 I finally finished the Rocky Mountain dreams quilt. You may remember I was working on it around Thanksgiving time. I picked blues to represent the sky, browns, reds and greens to represent the colors of the mountains. The pattern is Scrappy Mountain Magestries by Bonnie K. Hunter. Click here for a link to her pattern. I finished machine quilting, bound, and labeled. I used some of the walking foot techniques I learned in my Craftsy class from Jacquie Gering. Click here to read about that class. 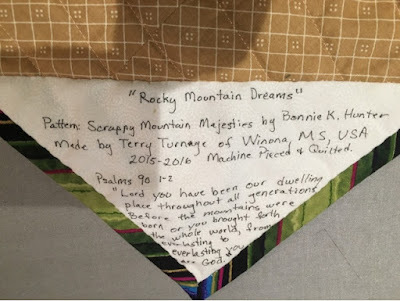 Since I named the quilt Rocky Mountain Dreams I decided to quilt it like a topographical map. 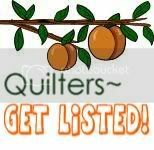 Yesterday my guild, The Possum Town Quilters, had a sit-n-sew day. We were very productive. We got the middle of two quilts done. They should have something on the blog about it soon. 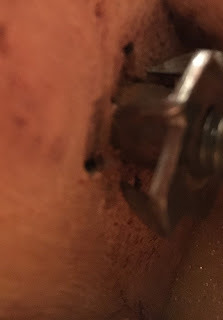 Click one link at the right to read about it. It was a really nice day and lots of fun to work on joint projects with a big group. Then I got a pedicure and had dinner with two other friends. Get out and make something. It makes you feel good. Upholstery and two fabric quilts. I spent most of the day trying to get the yucky upholstery off of a chair I bought soon after buying this house. It has been sitting around, first in the garage, and last summer I brought it in and put it on a cafeteria table I have been using as a dining room table. My son affectionately started calling it my large object de' art. I made the cushion a month or so ago, but have been hesitant to start on the chair. It is a wing back and I have never reupholstered a wing back chair. I got the back legs off with no problem...I am having trouble getting the front legs off. UGH! 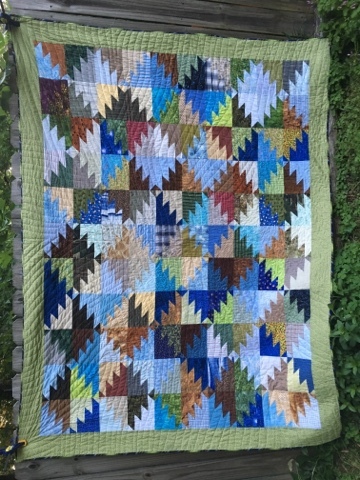 When my hands would get tired, I would go sew on my two fabric quilt. That is the theme of next years Mountain Quiltfest in Pigeon Forge. It is going to be either a baby quilt or a small throw. I am doing a stack and whack with the animal print fabric. I don't have any more of the great orange I used in the safari stars quilt, but I have some animal footprint fabric I used on the back of another quilt that I think that will work.